Habitat Apartments has collected, over 14 years of experience, more than 5,000 reviews with a general score of 8/10 and 96% customer recommendation rate. Spain's Leading Serviced Apartment Brand WINNER 2014, 2015, 2016, 2017 & 2018. All the apartments on our website provide real time availability, up to date prices and direct on-line booking without any preliminary process. We have been awarded as Spain's Leading Serviced Apartment Brand 2018 for the fifth year in a row in the 25th Annual World Travel Awards, a commendation to the best travel industry. Thanks to all our guest for trusting us! Book on-line without any preliminary process: Updated apartment availability so any apartment can easily be booked direcly on-line without any preliminary process. Best prices guaranteed: Prices are constantly updated including last minute offers. Secure payments: Habitat Apartments provides security for all payments using a secure system: www.thawte.com. Customer service: Already checked our homepage and really cannot decide which apartment is the right choice for you, or not sure which area would be best for your stay? We, at Habitat Apartments, are there for you. Send us a mail or give us a call, without any obligation. 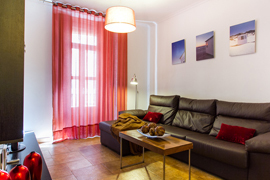 Great selection of holiday apartments in Valencia. We offer central Valencia apartments located in Old town, El Carmen, Malvarrosa and Old river bed.